A modern car bus, airplane, scooter contains dozens of computers, many of them assisting the brain and body of the driver to operate the vehicle. 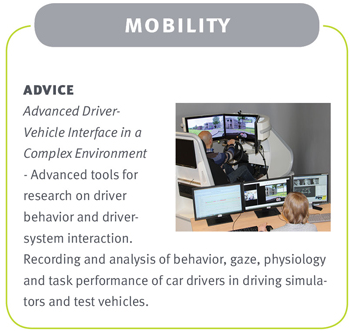 Innovations in this application domain can focus for example on driver safety, the safety of the environment, driver comfort, driving simulators, driver-vehicle interaction or autonomous driving. The human operator, driver, pilot, cyclist is the weakest link in safety. Over 80% of all accidents are caused by human error. He or she can be inexperienced, tired, angry, distracted, a poor driver, or downright irresponsible. It may be foggy or dark, a situation can be complex, or a split second decision proves to be the wrong one. Recent technological advances enable observing and combining multiple data sources: vehicle data such as speed or acceleration, navigation information, rear-view or night-vision cameras, eye trackers and psycho-physiological sensors. This makes it possible to monitor not only the state of the vehicle, but also its environment. Not just road conditions, but also traffic information. Not just Driver State Estimation, but also driver behavior. And last but not least: not just driver support, but also autonomous driving. How to keep the driver alert and grasp his attention at crucial moments when he has to take over control? Are you searching for an integrated solution to tackle your research and technical challenges, don’t hesitate to contact us for an information meeting – free of charge, of course!